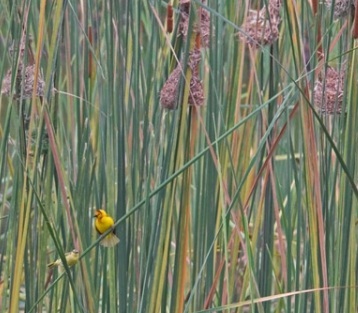 The Taveta Golden Weaver has a small global range, being found in northern Tanzania and a little into Kenya. It is named after a border town Taveta. It is common in its range and usually breeds in reeds. There is one PHOWN record: see here. Some great photos of this species may be viewed here. The 13th Pan-African Ornithological Congress (PAOC) will be held at Arusha, Tanzania, in October 2012, giving attendees the opportunity to see this East African endemic species.